This is a wonderful production of the classic musical. For this outing, there was a larger diameter to the Royal Exchange stage than usual. I reckon that at least one tier of inner seats had been removed to create the New York street scenes with fire escape and all. And to create sorely needed space for dancing. Needed because Aletta Collins’s original choreography, here energetically performed by a young and talented cast, was the outstanding facet of the show. In particular, the richly dramatic ‘dance moves’ accompanying the song ‘Play It Cool’ were perfect. Bernstein’s score, which augurs in a new America and can be considered a counterpoint to Gershwin’s Manhattan, makes the show (and the characters in it) tick; it is at the root of everything. The music is vital, twitchy, jangly, full of nervous energy. To do justice to it, the dance has got to be top-notch. As a song, ‘Play It Cool’ is super-ironic because these kids (for all their swagger and pose and apparent confidence) are anything but. They are uptight, prone to impulse, on the edge, trigger-happy. They have nothing and are fighting over a patch of neighbourhood in an alien land. Aletta Collins’s choreography for ‘Play It Cool’ showed you all of this: it was a group portrait of young, immigrant America: unstable, volatile and yet, for all that, full of promise. Certain songs in the latter part of the show express a yearning for peace and solace, but it is not forthcoming. This time out I was struck by a remark made by Doc (he is the wise, old head that people in the community look up to) along the lines that they, the kids, were behaving as though they were always at war. And I wondered whether this might have derived ultimately from what Bernstein saw and sensed when he worked in Israel (or Palestine, as it once was) in the ’40s and ’50s. Perhaps some of the insecurity and dread in the music derives from that experience? There is an unsought topicality in seeing West Side Story now, what with the prevalence of knife crime. It is unsought, but it is there. An ineluctable procession of tragedy. My review of an exhibition devoted to Leonard Bernstein at the Jewish Museum in Vienna is here. 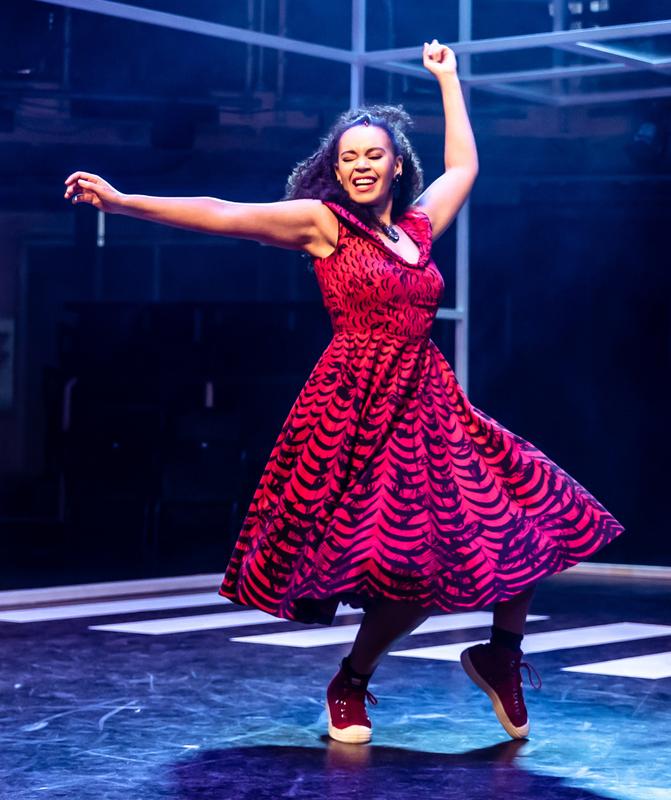 West Side Story is showing at the Royal Exchange until 25 May, further details can be found here. This was for the most part a gripping production of Vaughan Williams’ great ‘morality’, as he once termed it. Set during the First World War, we see Pilgrim as a deserter who leaves his fellow soldiers behind in order to search for a better way of life. After that, we pretty much follow Bunyan’s classic: Pilgrim encounters many people, the comfortable and the unfortunate and the damned, but none quite possess his urgency and his resolve to attain Christian virtue. My only qualm with the production was the ending, where we saw Pilgrim on the couch and a Freud figure listening sympathetically to his story. Somehow, it undercut Pilgrim’s Faith, which was until then (in my mind anyway: I bought it whole) inviolable. And I mean, is psychoanalysis (a pseudo-science at best) to be placed above Christianity? Really? Details of future performances of The Pilgrim’s Progress can be found here. 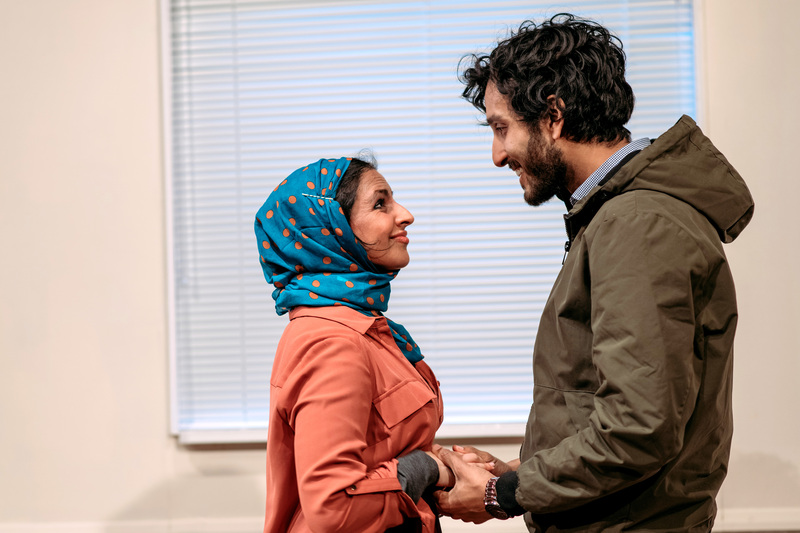 This engaged, emotionally-charged drama explores the issues of homophobia in the Muslim community and Islamophobia in wider British society. The key event occurs when a distraught young man, Tom ((Edward Stone), comes to the funeral parlour run by Ayesha (Aryana Ramkhalawon) and Zeyd (Assad Zaman). His close ‘friend’, a Muslim lad, has just died and he wants to arrange a Muslim funeral in line with his wishes. Sussing out that Tom is gay and thinking it too much of a hassle dealing with this particular death, they send him elsewhere. Later, Tom sues them for discriminating against him on the grounds of his sexuality. The legal action comes at a fraught time for the couple, anyway, what with their marriage hitting a bumpy spell. There is an asymmetrical aspect to their affection: the love is going mainly one way. And they have no children. The return of Janey (Francesca Zoutewelle), Ayesha’s childhood friend, adds to mix, is another catalyst for change. The Funeral Director, an engrossing, thought-provoking play of great integrity, is showing at HOME until 30 March, further details can be found here. The spirit of Nureyev lives on. This was a high-flying, heart-kindling production of what Jennifer Homans has astutely called ‘the most imperfect but most powerful of Russian ballets’. We were given a Swan Lake with choreography by Rudolf Nureyev as well as Marius Petipa and Lev Ivanov, a quite remarkable version of the ballet that was, in fact, first performed at the Wiener Staatsoper itself, in October 1964. Then, Nureyev took the role of Prince Siegfried and Margot Fonteyn, his ever constant companion during those days, had the part of Odette and Odile. It is a Swan Lake where the Prince Siegfried role, here ably performed by Denys Cherevychko, is both more athletically demanding in terms of dance and more prominent within the story as a whole. Indeed, there is also a psychological complexity here which is unparalleled elsewhere. Siegfried is a hunter who is preyed upon, and in due course cruelly toyed with, by the magician Rothbart. His desire and resolve are tested and, let us be blunt, found wanting; it seems as though Rothbart is his dark shadow, since he seems to know Siegfried better than he knows himself. Like a predator drone, Rothbart can precisely tap into the prince’s feelings of weakness and unworthiness. And he always finds his breaking point. Ultimately, Siegfried cannot escape his own nature: he wants the princess(es) he cannot have. He rejects the normal ones, the beauties of Spain, Hungary and the like. It is the otherworldly, swan-like creatures, the queer princesses, the captive queen, the damned and fallen that his heart yearns for. He wants something different. And his desire is always accompanied by an undertow of anxiety and dread. For this performance of Swan Lake we were blessed to be in a position (a box on the first floor) where we could fully appreciate the kaleidoscopic geometry of Ivanov’s corps de ballet sequences, the white swans moving en-flock, weaving their star-flight shapes. And Petipa’s dance of the four cygnets, for many people the litmus test of a good Swan Lake, was superb: a wonderful display of mastery and courage and faith in comradeship. It is clearly a product of the same country and culture that gave us the policy of ‘Not one step backward!’ (Stalin’s Order 227) during the Battle of Stalingrad. Swan Lake is the fruit of much evolution and compromise, which is perhaps in part what Homans meant when she called it ‘imperfect’. There is no overriding vision, or uniformity, to the dance. At root, it is Tchaikovsky’s magnificent score (not obviously ‘danceable’, and certainly not considered so by his contemporaries) that makes it great. That score will continue to challenge diverse choreographers, as here, and they in turn will make further demands on dancers. So, in time, the ballet will become more ‘imperfect’, more powerful still. Nureyev’s (and Petipa’s and Ivanov’s) Swan Lake is playing at the Wiener Staatsoper now, further details are here. This was a sublime Puccini double bill, two quite short yet perfectly formed operas. In the first, Suor Angelica, a nun – a young woman who had given away her illegitimate love child on entering the convent – learns of his tragic fate. And she despairs. His life is already over and she had taken no part in it. Her prayers to the Virgin, a mother herself, one moreover who had lost a son too, fail to bring consolation. So her despair gradually deepens and darkens. We return for the second one, where we spy an ostensibly mourning Florentine family gathered around the death bed of a patriarch. He kicks the bucket and, on examining his will, they discover that he has left the whole of his estate to a monastery. WTF? Who to turn to in order to correct this lax mishap? How to claw that filthy lucre back to where it rightfully belongs? There is deceit, greed and hypocrisy on show here; but the tone is not at all judgemental or moralistic. Instead, we are presented with a clear-sighted survey of human foibles, with a dash of Florentine colour. Oh, and a beautiful aria amidst the intrigue too: a daughter in love appealing to her father for his consent. The two operas complement each other very well indeed. There is comedy – Divine and poignant in the first, earthy and worldly in the second – and a dreadful excess of human feeling. We learn that human virtue, as well as vice, can lead to damnation. We cry a little in Suor Angelica, laugh a lot in Gianni Schicchi. Two maids are in thrall to their Mistress. This mesmerising version of the play, crisply translated by Martin Crimp, takes you right into the heart of Genet’s world. There are allusions to Miracle of the Rose at the start and throughout, and like in that novel, so here too, fantasy isn’t an escape from oppression but a displacement of it. I was surprised to find HOME’s Theatre 1 transformed into a theatre in the round (with video sometimes used for close-ups) and was unsure about the reason for this. Then I saw the audience opposite me ‘lit up’ at a certain point, looking for all the world like the Apostles at the Last Supper (think: Andrea del Sarto’s effort at the Vallombrosan Abbey), Believers hungry for sacrifice and spectacle. And anyway decided it worked. 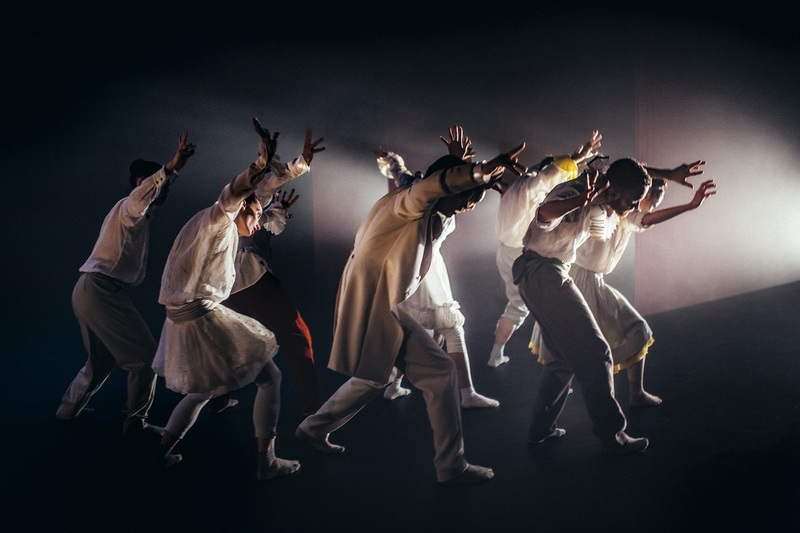 Actually, there are a lot of Catholic tropes in Genet – as Sartre recognised in his book on him – and this play, while on one level a sordid crime drama, offers plenty of scope for piety, ecstasy and debasement. Like the Maid of Orleans, these maids too are saints – of a sort. They suffer torment. They lament their fate. They glorify their Mistress, and even coronate Her: as Lorenzo Monaco coronated the Virgin in the painting that provided the inspiration for the EU flag. The Maids is at HOME until 1 December, details here. The Night of the Long Knives. If this description seems grim, well, it was anything but. Instead we had a show full of a gleeful, diabolical energy whose aesthetic was akin to that of a conte cruel or a Grand Guignol extravaganza. Its sinister ambience evoked the Dance of the Knights sequence in Romeo and Juliet, but whereas Prokofiev’s score is a kind of tango, Shechter instead went for a queerly rollicking percussion that was haughty, jolly and (in the end) infectious. As for his choreography here, it had violence and danger, yet also elegance and precision, and the dancers brought into this full pelt. It was like watching an elaborate checkmate – say King, Bishop and Knight checkmating a lone King – again and again, with each time a slightly different variation. There are few of us who are not fascinated by the cool display of unbridled ambition, by wanton betrayal, by the grand spectacle of the execution of our enemies and rivals (if only occurring in our imagination). SHOW is unlikely to purge you of this sinful, all too human fascination, though the purges depicted here will certainly satisfy it. Momentarily, at least. SHOW is at HOME until 3 November, details here. It is an overwhelming play when done right, and this Royal Exchange production does it proud. There is a father and his sons, and the world that they share, and the question of what is (or will be) their place in it. 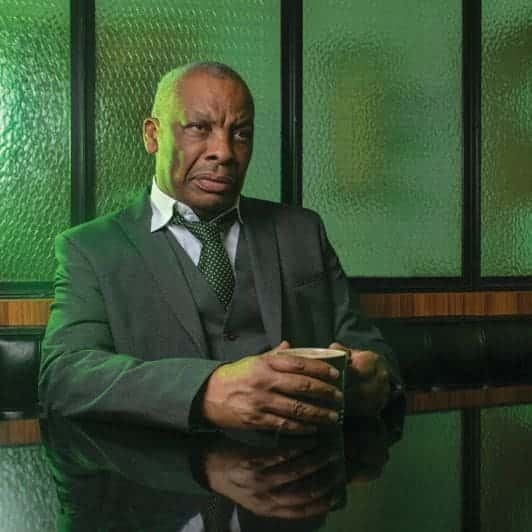 In his own sweet way Willy (Don Warrington) is trying to sell America as a land of hope and opportunity, and maybe even himself, his ambitions and dreams (they and America are inextricably interconnected), to his two sons. But the problem is, they are not buying – or at least they don’t think it (nor he) is all that it is cracked up to be. And in truth, as Willy has grown older, his energy and motivation have become eroded by experience and he too now has his doubts. The company men and technocrats have taken over, the ballsy dreamers are fast disappearing from the scene. Mind, you know that Willy will be back in the fight soon enough, for he has a tiger’s eye when it comes to closing a sale. He believes. A classic portrait of an American life. Death of a Salesman is showing at the Royal Exchange until 17 November, further details can be found here. A Shakespeare double-bill, two for the price of one: Manchester audiences can spot a good deal when they see it. We got Othello in the first half of theatre. At the end of that play, Desdemona (Kirsten Foster) and her slain sisters arose from the pit, resuscitated, and got ready to give Macbeth a weird welcome in the second half. Each play could, and in the first instance probably should, be appreciated in its own right. But it is interesting also to reflect on how they relate and refract upon one another – they have been brought together with that purpose after all, after all. So in that spirit, you’d have to say that the fusion was effective (momentarily, any roads) as a commentary on toxic masculinity. In one play you have Othello’s (Ery Nzaramba) jealous rages, in the other Macbeth’s (Sandy Grierson) cruel and murderous tyranny, and in both women are their victims. Desdemona is murdered, as is Lady MacDuff (here Melissa Johns’s performance was a highlight for me), her innocent cry that she had ‘done no harm’ failing to deter her killers. Of course it is not quite as straightforward as that with Shakespeare, it never is. You could argue, for example, that Othello is a victim too, a victim of Iago’s malice: though isn’t he a little too easily persuaded of Desdemona’s infidelity? 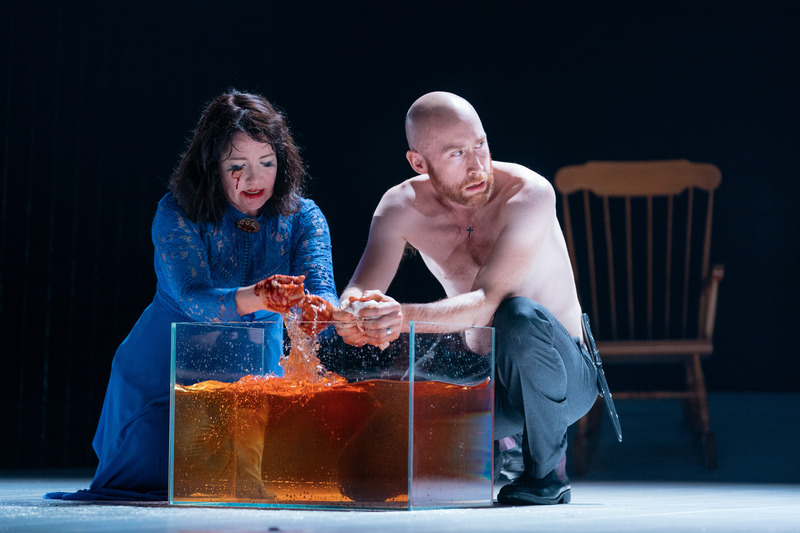 And Lady Macbeth (Caroline Faber) is the locus of evil intent in that play; and her complaint about her hubby is that he is too soft, has too much of ‘the milk of human kindness’ for his own good. And if the problem is men’s weakness, their frailty, then Macduff (Samuel Collings: another highlight for me), although a good man, is weak too. His response to grief is that he must ‘feel it as a man’ – and so he weeps. 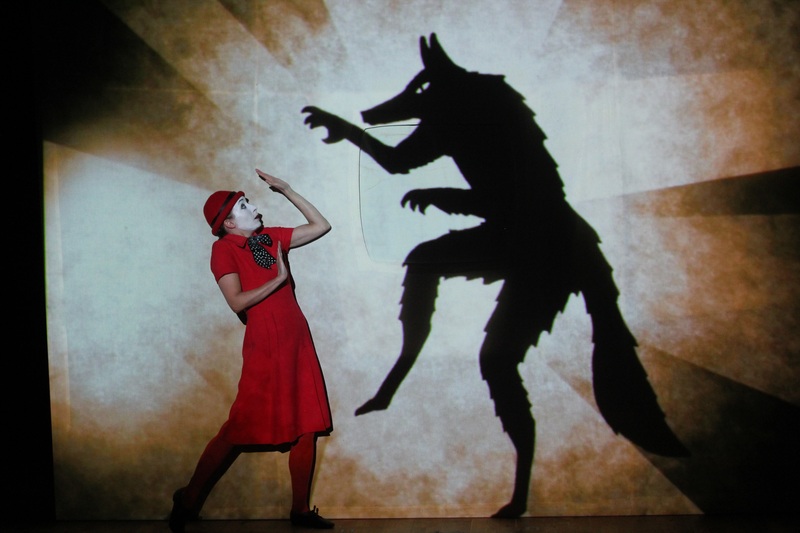 What is clear is that you have outstanding performances of two of Shakespeare’s greatest plays, brought together in a highly thought-provoking manner, which allows you to see each one in a new light. And incidentally, the end of Macbeth segues back into Othello once again, like one side of a Mobius strip leading onto the other. OthelloMacbeth is showing at HOME until 29 September. Details here.